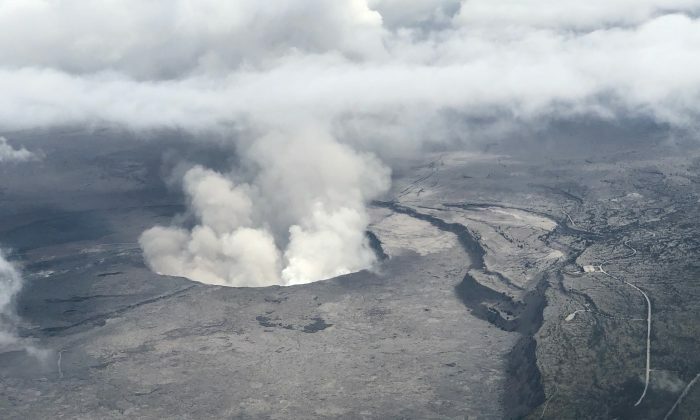 HONOLULU — The Hawaii community hardest hit by the Kilauea Volcano was ordered to be sealed off under a strict new mandatory evacuation on Thursday, May 31, as the eruption marked its fourth week with no end in sight. The Big Island’s mayor, Harry Kim, declared a roughly 17-block swath of the lava-stricken Leilani Estates subdivision off-limits indefinitely and gave any residents remaining there 24 hours to leave or face possible arrest. But the mandatory evacuation was “decided prior to that incident,” said David Mace, a spokesman for the Federal Emergency Management Agency currently assigned to the Hawaii County Civil Defense authority. At least 75 homes — most of them in Leilani Estates — have been devoured by streams of red-hot molten rock creeping from about two dozen large volcanic vents, or fissures, that have opened in the ground since Kilauea rumbled back to life four weeks ago. Lava flows also have knocked out power and telephone lines in the region, disrupting communications. The heightened volcanic activity has been accompanied by frequent earthquakes, as magma — the term for lava before it reaches the surface — pushes its way up from deep inside the earth and exerts tremendous force underground. After a month of continual eruptions at Kilauea’s summit and along its eastern flank, geologists say they have no idea how much longer it will last. The island’s mayor on Wednesday, May 30, renewed an emergency proclamation for 60 more days, allowing construction of temporary shelters and other relief projects to proceed on an expedited basis, without reviews and permits normally required. The month-old eruption of Kilauea, one of the world’s most active volcanoes, followed an eruption cycle that had continued almost nonstop for 35 years. So how did 1.5 million birds seemingly go unnoticed all this time?